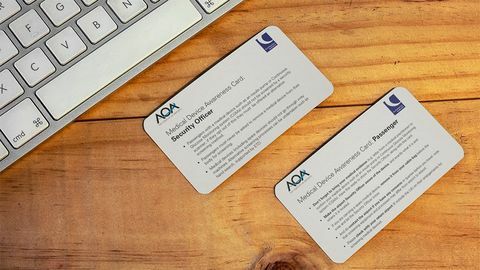 We are delighted to issue the new Medical Device Awareness Card sponsored by the UK Civil Aviation Authority (CAA) and Airport Operators Association (AOA), which covers both Insulin Pumps and Continuous Glucose Monitoring systems (CGMs). Due to potential damage, insulin pump and CGM manufacturers advise that the medical devices should not be exposed to x-ray screening and full-body airport scanners. Regulations allow passengers with these medical devices to ask for an alternative security screening process. Please click here to see the current statements from the major manufacturers Medtronic, Roche and Freestyle Libre. Passengers with a medical device such as an insulin pump or Continuous Glucose Monitoring system (CGMs) should not be screened by a security scanner; if they opt out of this they must be offered an alternative screening method. Passengers must never be asked to remove a medical device from their body for screening. Medical devices (including spare devices) should not go through x-ray machines. Alternative screening processes can be undertaken such as hand search, supported by ETD. Don’t forget to bring your medical evidence (e.g. letter from a medical practitioner) to confirm your medical device such as an insulin pump or Continuous Glucose Monitoring system (CGMs). Have this ready to show the Security Officer, along with this card. Make the airport Security Officer aware of the device, and exactly what it is and where it is located. If you are carrying a spare medical device, remove it from your cabin bag before the x-ray and let the Security Officer know. And do contact the airport if you have any concerns or queries before you travel: note that screening equipment and processes may differ from airport to airport. Please check with your return airport (if outside the UK) on their arrangements for screening medical devices. We also recommend that passengers use the service that many UK airports offer of a discreet identifier (usually a ‘sunflower’ lanyard), for those who have a hidden or not so obvious medical condition or disability. Please see the Special Assistance counters at the airport.